Pence accused the Chinese government of orchestrating an aggressive military, economic and political campaign to expand its influence inside the US and across the world. In an unusual and aggressive speech against China, the Vice President alleged that the ruling Chinese Communist Party was rewarding or coercing American businesses, movie studios, universities, think tanks, scholars, journalists and local, state and federal officials. "Beijing is employing a whole-of-government approach to advance its influence and benefit its interests. 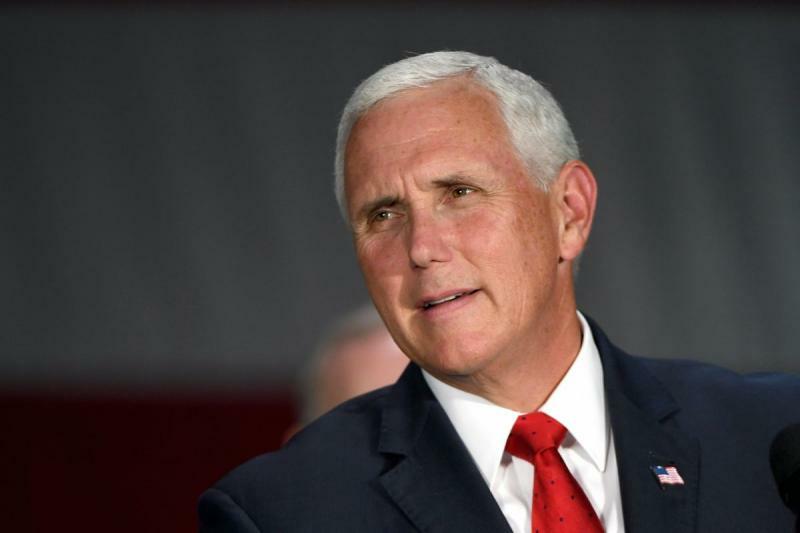 It's employing this power in more proactive and coercive ways to interfere in the domestic policies and politics of the United States," Pence said in a major policy speech on China. "Worst of all, China has initiated an unprecedented effort to influence American public opinion, the 2018 elections, and the environment leading into the 2020 presidential elections...To put it bluntly, President Trump's leadership is working; and China wants a different American President," he alleged. Pence's remarks came a week after Trump accused China of interfering in mid-term elections. He alleged China was meddling in America's democracy. "As President Trump said just last week, we have 'found that China has been attempting to interfere in our upcoming 2018 [midterm] election[s]," he said. US intelligence community says that China is targeting US state and local governments and officials to exploit any divisions between federal and local levels on policy. "It's using wedge issues, like trade tariffs, to advance Beijing's political influence," it said. Pence said that Beijing had mobilised covert actors, front groups, and propaganda outlets to shift Americans' perception of Chinese policies. "As a senior career member of our intelligence community recently told me, what the Russians are doing pales in comparison to what China is doing across this country," he said. "Senior Chinese officials have also tried to influence business leaders to condemn our trade actions, leveraging their desire to maintain their operations in China. In one recent example, they threatened to deny a business license for a major US corporation if it refused to speak out against our administration's policies," he alleged. And when it comes to influencing the midterms, one needs only to look at Beijing's tariffs in response to US's. They specifically targeted industries and states that would play an important role in the 2018 election. By one estimate, more than 80 per cent of US counties targeted by China voted for President Trump in 2016; now China wants to turn these voters against our administration, he alleged. "China is also directly appealing to the American voter. Last week, the Chinese government paid to have a multipage supplement inserted into the Des Moines Register – the paper of record in the home state of our Ambassador to China, and a pivotal state in 2018. The supplement, designed to look like news articles, cast our trade policies as reckless and harmful to Iowans," he said. Fortunately, Americans aren't buying it, he claimed. Pence said China's actions were not focused solely on influencing US' policies and politics, but also taking steps to exploit its economic leverage, and the allure of China's large domestic market, to advance its influence over American corporations. "Beijing now requires American joint ventures that operate in China to establish 'party organisations' within their company, giving the Communist Party a voice – and perhaps a veto – in hiring and investment decisions," he said. Chinese authorities have also threatened US companies that depict Taiwan as a distinct geographic entity, or that stray from Chinese policy on Tibet. China compelled Delta Airlines to publicly apologise for not calling Taiwan a "province of China" on its website and also pressured Marriott to fire a US employee who liked a tweet about Tibet, the Vice President said. In a strong message to China's rulers, Pence said Trump will not back down – and the American people will not be swayed. "We will continue to stand strong for our security and our economy, even as we hope for improved relations with Beijing," he said. "Our administration will continue to act decisively to protect American interests, American jobs, and American security," Pence said. The US and China are locked in a trade spat which began in April with Trump imposing tariffs on steel and aluminum imports into US. China retaliated by imposing additional tariffs worth about USD three billion on 128 US products. Trump, while demanding China to reduce the USD 375 billion by USD 100 billion retaliated with USD 50 billion tariffs on Chinese products. In retaliation, China announced plans to impose new tariffs of 25 per cent worth USD 50 billion on 106 American products including items like soybeans which could hurt American farmers.